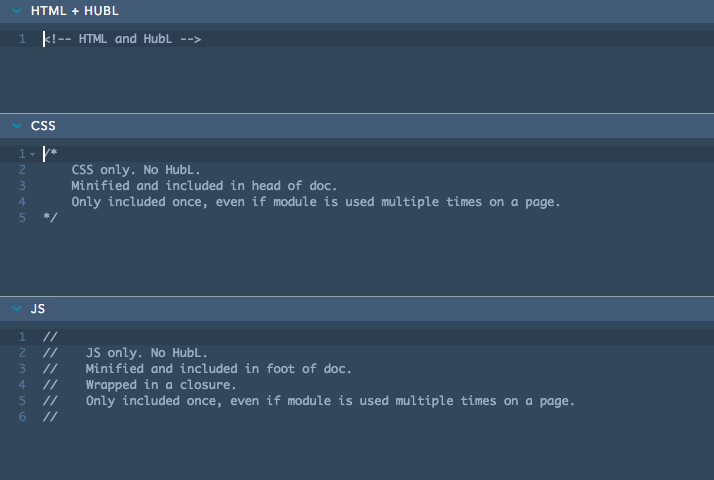 The new code editor contains separate sections for HTML+HUBL, CSS, and JS when you are editing a blog or page module. If you are working with an email module, you will only see the HTML+HUBL section of the editor. This distinction between module types is due to the treatment of CSS and JS in the rendered page as detailed below. What follows is an outline of usage and restrictions for each section of the editor as well as info on how each of these sections handles your code. Please also check out the critical known issues and restricted HubL sections of the reference page for details on code that is incompatible with the new module framework. CSS and JS are minified and included in the head and foot of the doc respectively. Module CSS and JS are only included once in a document, even if a module is used multiple times on a page. JS is wrapped in a closure for namespacing. Use appropriate HTML attributes such as data or class to output HubL into your markup. Use inline style if necessary. Add CSS or JS in the HTML + HUBL section. It is highly recommended that you wrap this code in require_css and require_js tags respectively. Note: since JS in the JS section of the editor is automatically wrapped in a closure, it will be in a separate namespace from JS in the HTML + HUBL section.